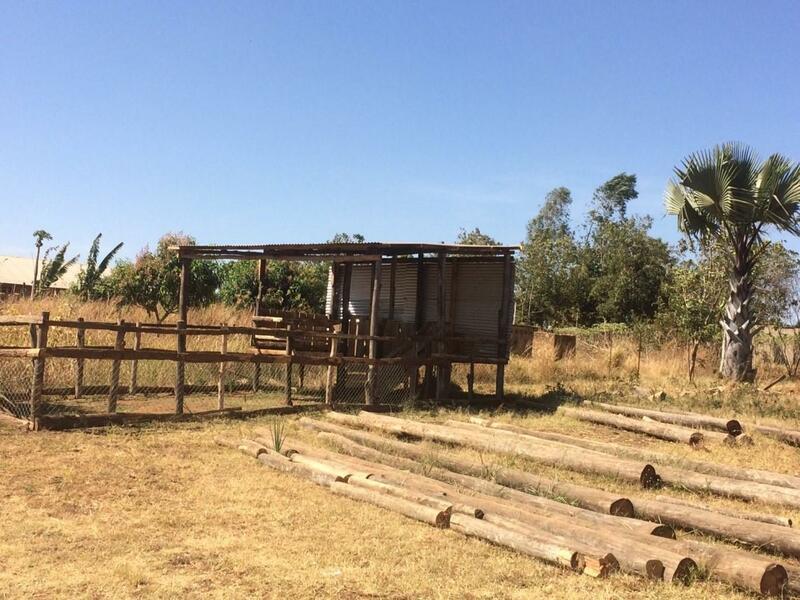 Pictured above is the latest construction built by Chris Ochaya and his friends at the Tamarind Farm in Uganda. You will recall that Chris was in Australia last year as a Royce and Jean Abbey Scholarship recipient to learn farming techniques. His previous project was the erection of a water tank stand and a pump house which is now functioning well and supplying fresh water for the local communities and for the farm. The new building is a goat shed. When Chris was in Australia he learnt some valuable lessons about how goats should be protected and housed. Part of the erection includes a raised section where the animals can rest without wallowing in their own waste. The goats will be a very useful food source and will provide both milk and meat for the community. The milk will be an on-going donation. The meat will be a once-off sacrifice. The poles pictured in the foreground of the photo will be used for the erection of the poultry shed which is the next big project on Chris's list. Click here to see a few more photos of the goat shed.